Update 21/11/18: Due to circumstances beyond the Museum's control this talk has been cancelled, and will be rescheduled, in the New Year, to a later date. We would like to apologise for any inconvenience that this may cause visitors intending to attend this talk on 5 December 2018. Peter Ramrayka was born in what was then colonial British Guiana (now Guyana). The grandson of indentured Indian labourers, he was brought up to believe that, despite his Indian cultural heritage, Britain was, in fact, the 'Mother Country'. With a steely ambition to become a lawyer, he travelled to England in 1961. 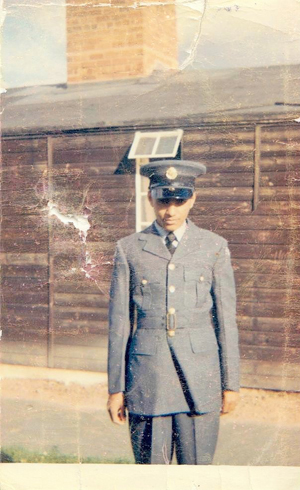 He joined the Royal Air Force as an option to both work and study. This led to successful careers and endeavours: the National Health Service; the Magistracy; political activist; Mission Director of a flying teaching eye hospital and much more. The RAF Stories series of talks form part of the RAF Museum's RAF Stories project. Launched as part of the Museum’s RAF Centenary Programme, RAF Stories is an online collection accessible to everyone to submit, share and explore stories of people’s personal connections to the RAF. In the RAF’s 100th year, the project will inspire the public to reveal the service’s influence on their lives. Visit www.rafstories.org to explore some of the fantastic stories collected so far and to find out how you can share your story. To contact the RAF Stories team please email us.